The solution is simple to find out what type is your Drive, HDD, or SSD in Windows 10 and 8.1! 1.) ... Open and run the Optimize Drives Tool on Windows! 2.) ... Create Optimize Drives shortcut on the Windows 10 desktop! 3.) ... Keyboard shortcut for Optimize Drives for Win-10! 4.) ... Start Optimize Drives automatically at Login or Windows Start! 5.) ... Pin Windows Optimize Drives on Start for Tablet Mode ie for MS Surface Pro! See also: ► ... defragmenter in Windows 8.1 / 8 (hard drives, optimization)! 1.) Open and run the Optimize Drives Tool on Windows! Please open the Optimize Drives Window (Defragmenter) in Windows 10 or 8.1 via the command dfrgui. And now you can see the type of the Drive Solid state drive, Hard disk drive, ..... in Windows 10 or 8.1! (Image-1) What type is the HD Drive, HDD, or SSD in Windows 10! 2.) 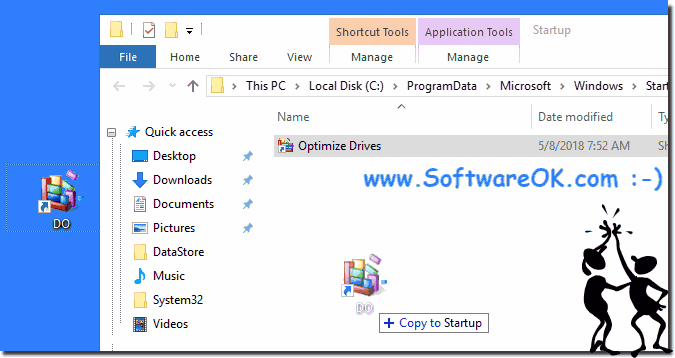 Create Optimize Drives shortcut on the Windows 10 desktop! This command will auto select the dfrgui.exe in C:\Windows\System32\ folder. And now simply use Right Mouse Drag and Drop and rename the Desktop Shortcut for example to DiskOK or DO on your Windows 10 Desktop. You can also run The MS-Explorer Windows-Logo + E and Browse to C:\Windows\System32\ scroll down to Drives Optimizer and select the dfrgui.exe File. 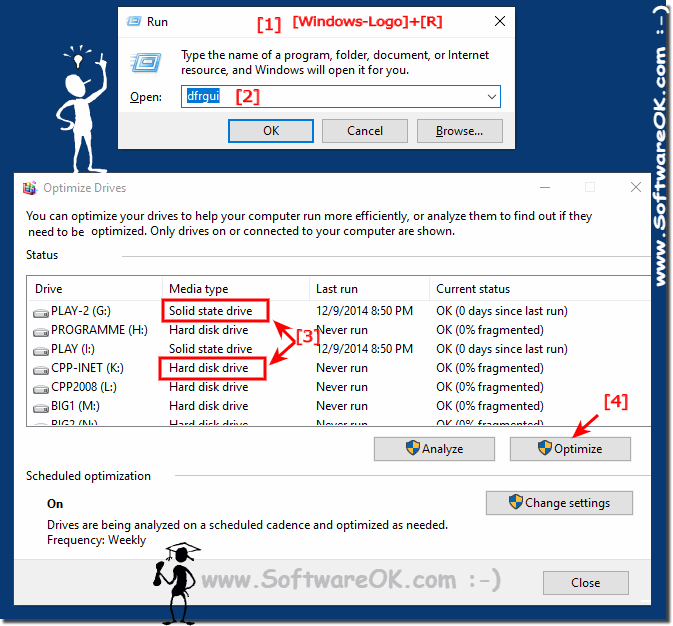 (Image-2) Drive HDD or SSD in Windows 10! 3.) 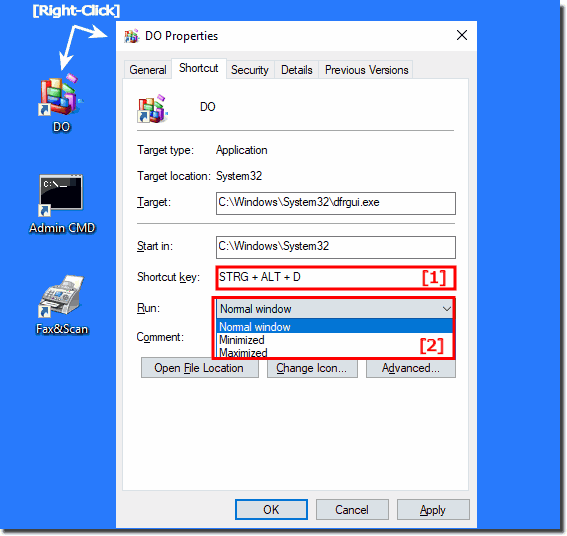 Keyboard shortcut for Optimize Drives for Win-10! A keyboard shortcut is also handy to start the Optimize Drives program. You can also start it from the Run dialog, but a direct keyboard shortcut will favor some Windows users because it's handy. If you have created the desktop shortcut for the Optimize Drives , you can use it to assign a keyboard shortcut for the Windows Optimize Drives function! Simply right - click on the keyboard icon , then assign it to the Properties option and the shortcut key. See also: ►►► ... Small Symbols in Task-Bar Windows 10! (Image-4) Optimize Drives keyboard shortcut! 4.) Start Optimize Drives automatically at Login or Windows Start! If you would like to add Windows Optimize Drives Tool to your own login, please use the shell:startup directory and if you want to start Optimize Drives Tool when Windows starts, for all users shell:common startup folder. If you created the desktop shortcut for Optimize Drives Tool, you can copy it directly to the Auto-Start folder. If you do not need the Optimize Drives Tool desktop shortcut, just delete it afterwards. (Image-5) Optimize Drives automatically at Login! 5.) Pin Windows Optimize Drives on Start for Tablet Mode ie for MS Surface Pro! 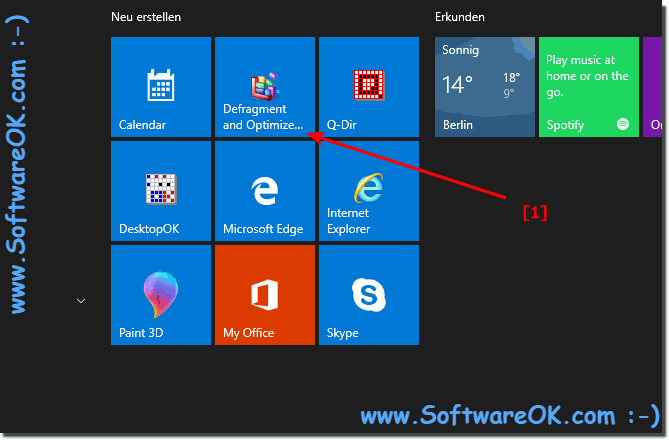 If you have created the desktop shortcut for the Optimize Drives, do a Mouse Right Click and Pin Windows Optimize Drives Tool on Start for Tablet Mode in example for MS Surface Pro! (Image-3) Drives Optimice from Windows-Start! Windows-10 - FAQ-11: How do i find out what type is my Drive, HDD, or SSD in Windows 10?